Ted was born on May 29, 1929 in the little town of Kerrobert, SK. Growing up on a farm as #9 of 13 siblings he learned early on in life how to work hard and be dependable. In the 1950’s Ted and his family moved to BC and built both an orchard and a family motel. After finally marrying his love, Carroll, in 1967, Ted settled in Okanagan Falls and fully took over the motel. South Shore Motel became a quiet haven for many families from the Vancouver area in the summer months. Concurrently, he worked in the Oliver SunRype plant where, with his hard work, he soon became the plant manager. In 1984 he was transferred to Kelowna where he worked many more years as a valuable SunRype employee. After retirement, Ted, who never liked to slow down, drove the bus for various retirement homes throughout Kelowna: Lakeshore Place, Missionwood, and Sandalwood. He loved working with people and enjoyed serving others wherever he went. 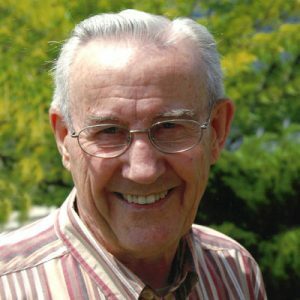 He also spent many years serving his local church as Sunday School Superintendent, teacher, youth director, song leader, and usher. Whenever he had free time Ted could either be found cheering on the Canucks or the Blue Jays, playing games with Carroll or his grandchildren, or puttering in his garden. Throughout his life he was known in his neighbourhoods for his amazing roses, tomatoes and raspberries. Everywhere Ted went, people knew him for his integrity, hardworking spirit, tender giving heart and his fantastic smile! He was dearly loved by all who knew him, and he will be missed. A Celebration of Life will be held on Wednesday, April 17, 2019 at 1:30 pm Springfield Funeral Home, 2020 Springfield Rd, Kelowna, BC with Dr. Gord Fletcher officiating. Please keep this a scent free event in consideration of those with allergies. In lieu of flowers, memorial donations may be made to Cancer Research www.cancer.ca or to the Far East Broadcasting Canada, www.febccanada.com. THIS SERVICE WILL BE BROADCAST/LIVESTREAMED ON WEDNESDAY, APRIL 17, 2019 AT 1:30 PM. The service for MAGNUS, Theodore “Ted” Raymond is scheduled for Wednesday, April 17, 2019 at 1:30 pm . Below you will find the map for the service location and the contact information should you have any questions. We are sad with you about the loss of your husband, father and grandfather and our uncle Ted, who was a wonderful man. Our sympathy and prayers for peace to you all. We read the obituary online and will watch the streamed celebration of life. Lots of love ❤️ to you. and visiting with you all later! John always looked forward to a visit with “Uncle Ted”! Ted will be greatly missed as he was so kind, thoughtful and welcoming regardless of the situation. Like Grandma Helen, he had a marvelous gift of taking life as it comes – a Magnus trait that I have appreciated over the years. I am sure you have many fond memories from which to receive comfort in these days of shock and bereavement. I send healing thoughts and prayers for you and your whole family. May you find day by day strength in the weeks ahead. .
My deepest sympathy to the family. I’m sad to lose a favourite uncle, who was involved with my life from childhood, and who had such a positive impact, and kind influence on me. Today is a day to remember a wonderful man. I know that he touched my heart and my life in so many ways. Aunt Carroll, Joy, and Mel, and families, I share with you your grief, and i rejoice with you that he is now with our Saviour, and with so many of his family…. I’m sure that my mom and Uncle Ted are having a great conversation. Dearest Carroll you and Ted were the most amazing neighbours we ever had, such a testament to Christian life and how a Christ follower should conduct themselves.. He will leave a big hole in our hearts and lives. He was such a patient and caring man and always so thoughtful. Our prayers and condolences now are for you, the girls and their families we pray God gives you strength, peace and comfort now and going forward. Our love, thoughts and prayers are with you and the family today.. I’m sorry I can’t be there today but I will watch online, thank you for setting that up..
Carroll, you and Ted meant so much to me as a teen…to have someone to walk down the street and talk to. Or the times you both were in charge of the youth group and you both being generous to allow me to drive with you. You both were an integral part of making me who I am today (I always remember you having me learn with you in the kindergarten SS class). I look forward to one day seeing his calm, cheerful demeanor once again! Vic and Diedie didn’t make it, right? It was so nice to see the picture of the four of us included! Good memories for sure! Praying that you will keenly sense God’s presence and experience His comfort during this time of grieving. You are not alone. Love you! So sorry to hear about Ted’s passing but can’t help but think about how he is rejoicing now……….he is finally home! Your life will change as mine has but we keep pressing on. God is good! The memorial service was beautiful and I was so pleased to have seen your two lovely daughters. They did such a good job of highlighting their father’s life. I was also happy to see a picture of the four of us! Such good memories for sure. Praying that you will be keenly aware of God’s presence and feel His comfort as you go through this time of grieving. Hugs!